The Villa da Pinheira is located on a hill in Funchal, in a quiet area, has a unique view of the Funchal amphitheater. The distance from the Funchal International Airport is 15 minutes and roughly 5 minutes by private car from the center of the capital Funchal, is a starting point for the whole island, its interior is spacious, all rooms comfortable and natural light and great views. Its exterior has large terraces all around the house, private garden, barbecue, recreation areas, private, where you can enjoy an outdoor breakfast, read or just relax you. In short its location and veégétation allowed you to enjoy a mix of environments. They are available free of charge, cot, high chair and baby bath. In addition, for a good price, we also have available, car seat child. You can also opt for a stay in a luxury villa in the city center (3 minutes walk to the farmers market and the old town), in a quiet street in one direction and Villas with pool in the center -city. (2 suites available, pool, garden, kitchen, washing machine, etc.) For more information contact the owner. Filomena, the property and Madeira are amazing in equal measures but in their own unique way. Filomena is so friendly, cheerful and extremely helpful she made our experience of Madeira even better. The property is situated overlooking Funchal with breath taking scenery from the hills to the harbour. It is about of 10-15 minutes car drive from the centre of Funchal. I recommend a car due to the location and steep hills and lack of pathways in some areas, plus you can see more of the Island at your leisure. We cannot recommend this property enough with well thought out facilities and beautifully kept large gardens at your disposal with various seating areas and brick built outdoor BBQ and sink. We would definitely return one day and will hopefully be able to stay here again. Thank you again Filomena for your help and being such an excellent host. It was a wunderful holiday, the view was amazing!!!! Ende März haben wir 10 wundervolle Tage in diesem Ferienhaus verbracht. Der große, sehr schön angelegte Garten, die Nähe zu Funchal, die günstige Verkehrsanbindung (ein Mietauto ist trotz nahegelegener Bushaltestelle empfehlenswert!) und natürlich der traumhafte Ausblick haben das Haus für uns zur perfekten Unterkunft auf Madeira gemacht. Im Haus ist wirklich alles vorhanden, was man für einen schönen Urlaub braucht. Da es auch im März noch sehr kühl sein kann bzw. war, haben wir den Kamin als romantischen Heizungsersatz genutzt. Nicht nur deshalb haben wir uns vom ersten Tag an heimisch gefühlt. Darüber hinaus ist Filomena eine tolle Gastgeberin, die uns bei allen Fragen rund um das Haus und die Insel unterstützt hat. Der herzliche Abschied hat uns die Rückreise nicht leicht gemacht, aber wir sind uns sehr sicher, dass es ein Wiedersehen geben wird! Muito obrigado Filomena e até a próxima!! Lovely couple, polite, friendly, they left everything spotless, I highly recommend and I would be happy to welcome them again,it was great to meet them. We cannot thank Filomena enough - a superb host who went out of her way in everything to make our stay welcoming and perfect in every way. Nothing was too much for Filomena - why cannot every holiday property owner be like this !!! 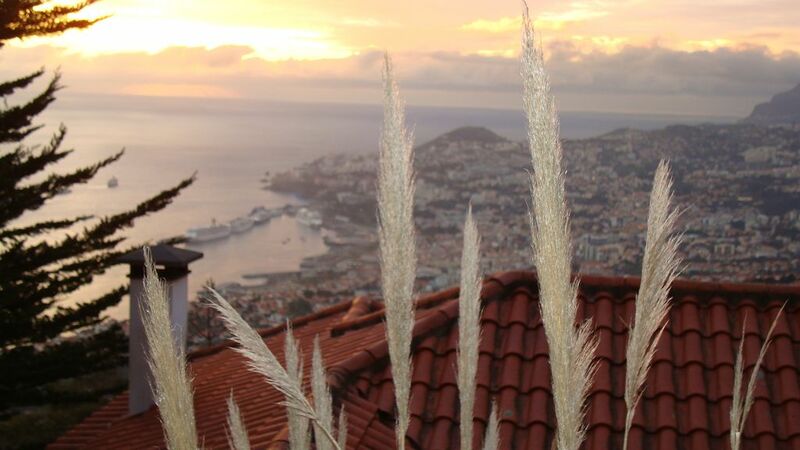 The property is stunning with amazing views over the city of Funchal, the harbour and the sea. Spacious and with every facility, spotless and well maintained. We do not hesitate to award it 5 stars. We had a hired car for the duration of our stay and once we got used to the climb up to the property - it became a breeze thereafter. I would say that the location of this property means you need a car. It is only 15 minutes drive down to the sea front and the centre of Funchal - or maybe a 10 minute walk downhill to catch a bus into town. But a steep walk back afterwards !!! However - this in NO way detracts from the property location and stunning views from the balcony. Superb - our first time to the island and we couldn't have found anywhere nicer to stay. Muito obrigado Filomena - your beautiful house is a credit to you and thank you for all you did to ensure our holiday was no less than PERFECT.. I can say no more than we'll be back !!! Ce fut un charmant séjour, cette île est très agréable et la position de la maison permet de l'explorer nous ne sommes pas prêt d'oublier la magnifique vue sur Funchal et son port.